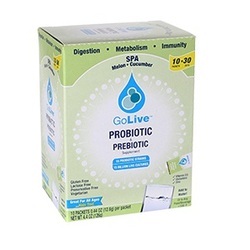 Experience the GoLive DifferenceGoLive is formulated to be an optimal combination of complex probiotic strains and essential prebiotics. Our proprietary blends consist of clinically-tested probiotics coupled with the highest quality prebiotic sugars and prebiotic soluble fibers necessary for the probiotics to consume, grow and flourish - therefore playing a key role in health and wellness by assisting and maintaining the body's digestive, metabolic and immune functions.Unlike other probiotic products that are yeast-based, blended in moisture at time of production (therefore, consumed in a post-fermented state) or consumed in a static state, GoLive is yeast-free and freeze-dried to liquid, GoLive probiotics begin growing rapidly and are consumed in a dynamic state so they may influence the gastrointestinal tract - the location of 70% to 80% of the immune function, 100% of the digestive function and the basis of metabolic function.GoLive ... Be Well No other probiotic products come close to the complex blend of quality ingredients and resulting effectiveness of GoLive . Experience the GoLive difference of better probiotics, better prebiotics and better effects.